-I happened to be on Twitter last when the Suicide Squad review embargo was lifted and oof! The critics are absolutely hating on it, so much so that dumb fanboys are now petitioning to have Rotten Tomatoes shut down — which is kind of like complaining that a newspaper prints too many crime stories. (This is why I now try to limit my tweets about superhero TV; DC fanboys are the WORST.) Meanwhile, THR’s deep dive into what went wrong with this movie is fascinating. 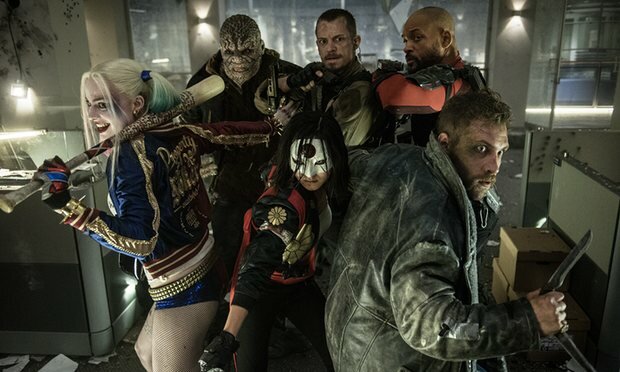 Warner Bros execs were reportedly so blindsided and rattled by the critical response to Batman v. Superman that they even brought in the team who made the (admittedly great) first Suicide Squad trailer to help tweak the movie, which is…wow. –Channing Tatum is set to star in Splash remake, playing the mermaid while Jillian Bell will play the character originally played by Tom Hanks. I love this news, especially since Tatum is never funnier than when he’s with Bell. Have you seen his Idiotsitter episode? If not, this clip should convince you to rectify that. -Teen Wolf star Tyler Posey has apologized after pretending to come out. Wait, what? –Bradley Cooper allowed James Corden to tase him. I really wish I had that opportunity after seeing All About Steve. -Surprise! We’re getting a new Britney Spears album this month! -Welp. This isn’t good news for the Cruel Intentions reboot starring Sarah Michelle Gellar. NBC is reportedly looking at “alternative platforms” to air it. -Pro gun nuts ran Daisy Ridley off Instagram. –Jonah Hill told Fallon a story about the time he accidentally emailed Drake his daily food journal (the point of said story is to let y’all know that he has Drake in his contacts). -As if you didn’t already love the kids from Stranger Things, it turns out they’re all really good singers. -Meanwhile, as good as Stranger Things is, this is a really great piece on how the show misses the mark with its female characters. -I don’t know what makes me happier: that there are a bunch of videos floating around of the Arrow cast breaking into showtunes from Hamilton, or that in each one, the guy who plays Det. Lance seems really annoyed by it. -Once again at the TCAs, HBO was somehow blindsided by questions on its shows defaulting to sexual violence against women. Sigh. -Meanwhile at the TCAs, Archie Panjabi gracefully deflected questions about her messy exit from The Good Wife. Proper ’cause that wasn’t the place for those kinds of questions, but can she just go ahead and do a Vanity Fair tell-all interview already? –Julia Stiles didn’t love riding a motorcycle with Matt Damon on the Bourne set. –Tatiana Maslany heads to the Arctic but can’t escape her past in her new movie Two Lovers and a Bear.